The Errors & Omissions policy is an optional Insurance Policy that protects you in the event of any errors while notarizing documents. the filing fees on your own. You file the Notary Application, Bond and pay the filing fees on your own. 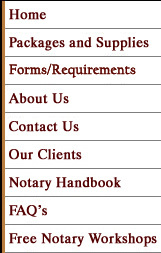 A copy of your current Notary Certificate must be included with your order.